Our kit has been on the market since the fall of 2006, establishing it as the first real-world proven high-power turbo kit for the 2006 – 2011 Honda Civic Si. Whether it’s Honda of America Racing Team running hard at the Redline Time Attack series or our customer Robert with over 60,000 miles on his kit, the AJP turbo kit has the power you need for the track and the reliability you need for the daily commute. Our kit is bolt-on, so you do not cut up your car, destroy your front bumper or remove your fog lights just to make everything fit. With the Hondata FlashPro, you can reflash your ecu as many times as you want. Our FlashPro calibration file is available for free. FlashPro is a device that can generate a wide variety of reflashes similar to the original AJP turbo reflash. We have had no problems with FlashPro. Our kit produces big power with low psi, so you do not have to build your engine. Your stock engine will handle the power all day long. The only maintenance you need to do is to change the oil and spark plugs on a regular basis. 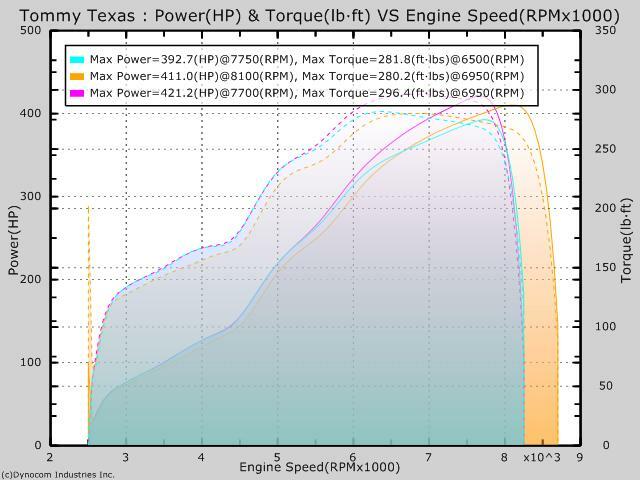 At 4.4 psi to 11 psi, you get plenty of power: 300 whp – 420whp (with installation of optional fuel return kit). There is no replacement for a test drive in an AJP-turboed car. The sensation of getting pulled so hard you feel like you’ve left one of your major organs behind is priceless. Reactions have ranged from a big wide smile to one customer who got down on his knees and bowed (we kid you not). If you can stop by our shop, we’ll be happy to schedule a test ride in one of our customer cars. While we have done the majority of the installations, your local performance shop can also install the kit, provided they have proficiency in turbos. A few of our more knowledgeable customers have installed it themselves. An economical upgrade without building your motor. 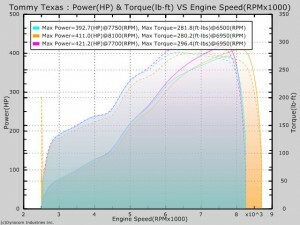 You must modify your motor and add a few other parts to get 80 more whp than our basic setup. We recommend that a professional shop do this installation option. Massive power. Kick your horsepower up sky high by building your motor. This is not for first-time turbo owners! Shock and Awe. A sleeved block boosts your horsepower up to mind-boggling, gut-shaking levels. This is not for first-time turbo owners! Payment terms: 50% down payment, balance due on completion of kit. Hondata FlashPro is our primary tuning. 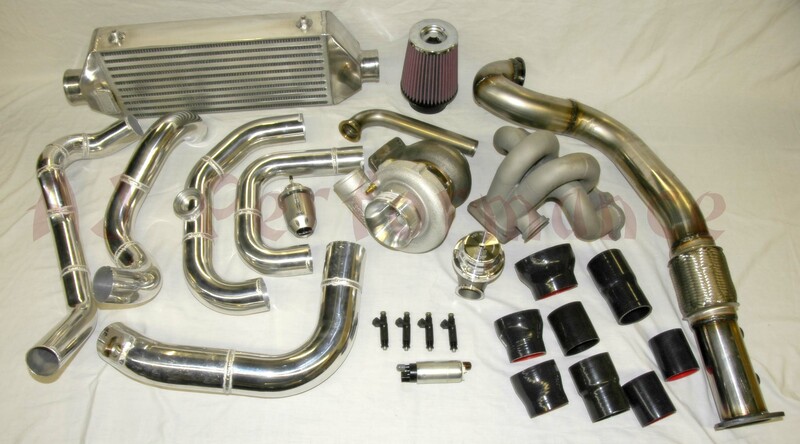 Fuel Return Kit: This kit provides additional fuel when you increase the boost. It is an external fuel pressure regulator. Normally, your shop can build one for you but if not, we can put one together for you. It is a safety enhancement to make sure there is always enough fuel in the system. If you do not install this, you will max out at 380 whp. Modified Oil Pan: The turbo is oil-cooled. You will need to tap a hole and mount a fitting in your oil pan. You can do it, your shop can do it or we can do it for you with this option. The AJP 3″ downpipe is designed to work with the AJP 3″ exhaust. All other exhaust systems will require a custom-fabricated spacer to mate with the downpipe. We can provide this service for our in-shop installations. You will need gauges, both wideband and boost controller. You can use AEM or any other set. The Competition Clutch disk holds the 400+ whp much better but it still drives like stock. Bader Dashti, of Kuwait, cranks out the same horsepower on his Dynojet dyno with the car that used to be Julio’s. It has a built motor. “The Evo, the Subarus, the SRT-4; those three are the top of my hitlist. They are on top of my hitlist and by the way this car is moving, they’re gonna go down. They just don’t know it yet, though. If 420 whp is not enough for you, we have the AJP Road Monster Package, which puts the AJP turbo kit on top of a built motor. You will get significantly more wheel horsepower when you leave our shop. Plus you will rest easy knowing that your engine is that much safer. The AJP Road Monster Package was introduced in late spring 2008 with the addition of the AEM Fuel/Ignition Controller. This enabled us to work around the 8.5 psi boost cut imposed by the Hondata reflash. With the introduction of the Hondata FlashPro, there is no 8.5 psi boost cut and the AEM F/IC is no longer needed. Lastly, you should upgrade your wheels and purchase drag slicks for track use. You will not be able to hook properly with drag radials. AJ Performance does not encourage unsafe driving. Bryan of Portland, OR, demonstrates the durability of the AJP turbo kit as he competes in autocross. “The car was a blast to drive, and I think we really showed the potential of the Civic Si.